The complete lamp with PV panel and multi outlet USB cable. 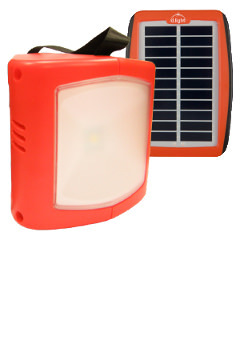 D-Light S300 is a solar PV charged lantern unit designed initially for use around the world in areas and countries without reliable AC power. We have had the D-Light S300 on trial here in the UK for many months and it has a huge thumbs up from our team and others. The unit is supplied as a complete package with high quality internal lithium battery, robust solar PV cell and accessory plug pack to enable the used to charge a variety of mobile phone and tablet devices. The lamp is fitted with a high specification LED to provide a powerful light source for use in domestic, working and emergency situations. The inbuilt electronic regulator enables the user to select 4 different light oitput levels from low through to full power. On the lowest setting the battery will power the lamp for around 100 hours whilst the most powerful setting will give the user 4 hours of crisp wide angle light. The lantern hand be hand held and used as a near field search lamp or to provide excellent illumination for breakdown situations for example. Additionally, the lamp can be suspended from the centre section of the handle for superb overhead lighting to provide light for task work, reading, sewing, etc. For orders above 19 units please contact us. Sorry, D Light is no longer available from OnSolar.